wenn wir ein Kontaktformular absenden bekommen wir die im Anhang ersichtliche Meldung. Hat jemand eine Idee warum das Formular nicht abgeschickt wird, sondern diese Meldung zum Öffnen der Datei erscheint? Can you present your issue in english please ? We are short on German speaking staff at this moment. if we send a contact form we get the message shown in the attachment. Does anyone have an idea why the form is not sent, but this message appears to open the file for example in Firefox. What version of Joomla and BF are you using ? Can you please check if you are running Joomla Cache on your website ? If you were using Cache so far, try to disable it / delete your cache and try to re-submit the form. 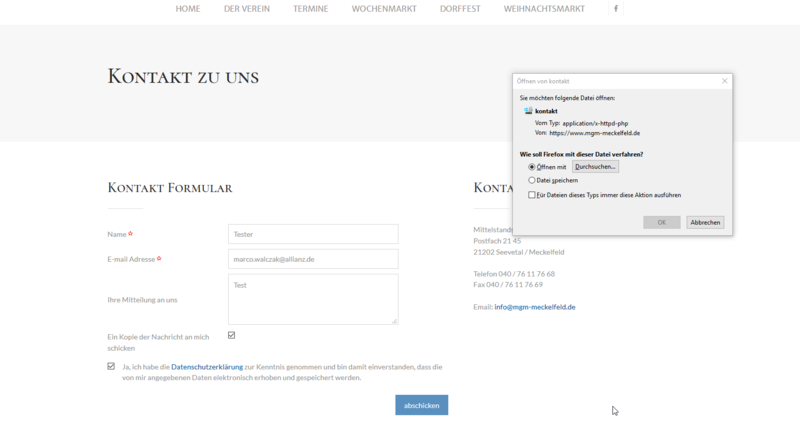 The Problem ist that this fail is not on my browsers. On the browser I'm using it is all correct. But on the browers of a client it does not work correctly. Joomla and BF are the latest versions. Does your client uses Add blocker ( or anything simmilar ) for his browser mabye ? What is the code behind that opens this download box ?